I have some sleeves but never tried one. Any trick to fitting wood to sleeves? What adhesive to use? Does the back get violated in the process.....Looked for build a long but no luck. Whatever you know on it would be appreciated. Without OCD, none of this would be possible!! Smooth- On MT13 and there is a great chapter in TTB. One hint, be gentle with the sleeves, don't clap them in a vice and don't force them onto the billets. I just use a good epoxy, not the 5 minute kind, in case I have some trouble. I violated the grain on my last sleeve installation, being a non bending part of the handle I didn't think it would matter, it did. Eric I had the very same thing happen to one I attempted, but I admit I really dug in on that one. It wasn't just a bit of violation. Eric, was that sleeve round, or was it flattened on the back? 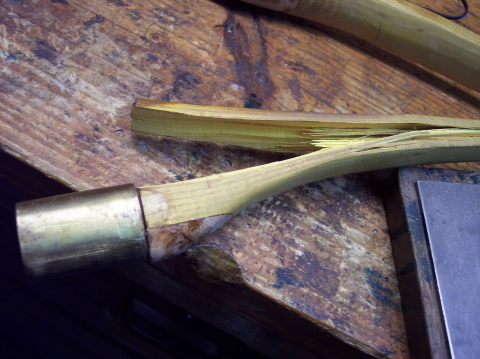 I have a d shaped splice sleeve, and a set of yew billets form Pearl. I want to make sure I understand the process VERY well before I attempt it. Thanks. Kyle I can answer that based off his pic. That is the small sleeve set that is D shaped on its end view. One major bonus yew has over any other woods is you can get away with violating a back, quit a bit at times. Especially when its right at the grip. Do your best to keep the sapwood as even as possible and glue them in. Ok, now I have enough info to give it a go. Thank you all.